Rings have always been every woman’s favourite ornament. A beautiful pair of ring can easily deck up even a simple attire and make one stand out in a crowd. Cocktail rings are the hottest trend among women nowadays. A cocktail ring can easily add a lot of glamour to any attire and Gold Cocktail Rings are definitely a style to be flaunted. That is where CaratLane steps in with its massive collection of Gold Cocktail Rings to entice women into binge shopping. From traditional inspired to contemporary designs, gold cocktail rings are a go-to place whenever you are trying to add an extra spark to your outfit. The trend of Gold Cocktail Rings is here to stay. Priced between Rs. 10,000 and Rs. 75,000, CaratLane offers around 20 interesting designs of cocktail rings for women. Set in 22K yellow gold and 14K and 18K rose gold, each of the cocktail rings available online on CaratLane are special. The Ikat collection by CaratLane has some mesmerising and colourful range of cocktail rings. The Encircle Gold Ring from the Ikat collection, set in 22K yellow gold is a beautiful ring in a ring design. The Grainy Hex Gold Ring from the Ikat collection, set in 22K yellow gold is another pretty cocktail ring. The Sunflower Gold Ring is a cocktail ring which is a modern design yet rooted in our traditions. Floral designs are the first choice when it comes to choosing a cocktail ring. 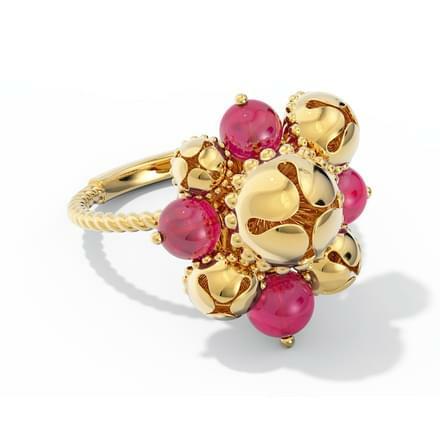 Flower-shaped rings are perfect to be paired with all traditional dresses. 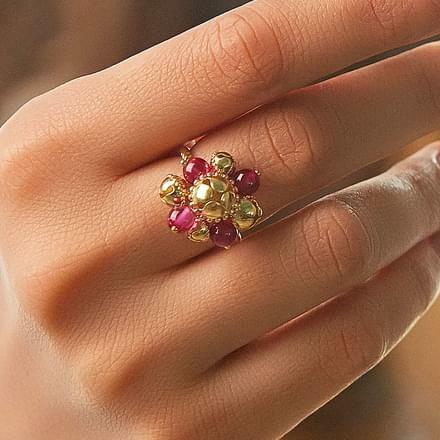 CaratLane's designs include the Ornate Bloom Ring, the Textured Drop Ring and the Duo Floral Ring, all set in 22K yellow gold are stunning designs of Gold Cocktail Rings. 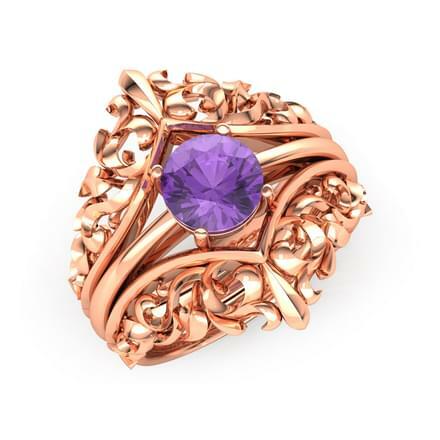 The Stackable Filigree Ring from the Enchanted collection, set in 18K rose gold is a truly enchanting pair of ring from CaratLane's cocktail rings range. The Gaura Lotus Gold Ring from the Uttarakshin collection, set in 22K yellow gold is a stunning piece of gold jewellery inspired from the flower, Lotus. It is a perfect cocktail ring to be paired with traditional dresses. The conch-shaped ring, the Marquise Cutwork Gold Ring from the Dhokra collection by CaratLane, set in 22K yellow gold is a perfect example of great craftsmanship and design. Square-shaped Gold Cocktail Rings are a style worth checking out. Some of the designs available on CaratLane are the Square Deco Gold Ring and the Framed Filigree Gold Ring from the Dhokra collection, set in 22K yellow gold, which are truly spectacular. Simple yet stylish, the Tapering Cone Gold Ring and the Grace Curves Gold Ring from the Dhokra collection, both set in 22K yellow gold are great pieces of well-crafted fine gold jewellery for women by CaratLane. CaratLane is offering online a huge variety of Gold Cocktail Rings for women to check out. It ensures that its ornaments are best in quality and designs and also at the right prices. The portal is constantly working towards providing a hassle-free online shopping experience to its customers. CaratLane offers various online payment modes as well as lifetime exchanges and 30-day free returns to its customers. 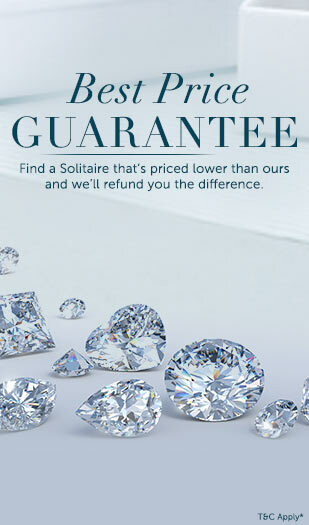 You can also avail its Try@Home facility to try jewels at home before buying them.